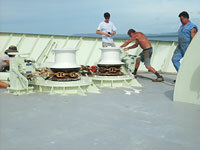 At 9 am, central time, the R/V Knorr's anchors were lifted and we were underway. Suddenly, I could feel the boat moving over the waves. 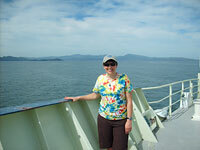 A few of us hustled to the bow of the ship and watched the shorelines change as we sailed past them. The bay where we were anchored has a 2-3 m tide and the incoming rivers carry a significant amount of sediment. There was a very distinct line between the incoming, sediment-laden fresh water and the seawater. At that line, you could see leaves, branches, tires, plastic bottles, plastic sheeting, plastic buckets, plastic, plastic and more plastic. Seabirds roosted on it, fish netting floated behind it and fishermen collect it. Several of us went up to the bow of the ship when we heard we would be raising anchors. Mandi Klingensmith took this picture of me with the Costa Rican shoreline in the distance. Plastic was a bit of a theme today. The Captain had full crew meeting this morning where we went over safety, emergency drills and procedures, and ship operations. The steward, Theresa, discussed the issue of plastic and trash. On the ship, trash is kept to a minimum. What trash is created, is sorted into bins of biodegradable and plastic, metal and glass. We were asked to be very conscientious about any waste plastic, putting it into the proper waste containers whenever we find any. After the meeting we got to work: writing procedures, or protocols. Yes, real scientists write out their procedures BEFORE they start their projects, just like I ask my students to do before they being their experiments. These procedures are written to help organize our thinking and to predict any challenges that we might have to overcome. Once sampling and data collection is started, it is sometimes necessary to make small changes to the protocols. In general, we are able to work out many of the bugs before we ever begin, saving time, energy and resources. My group is in charge of writing the protocols for describing and some of the sampling of the sediments brought to the surface. I worked on these most of the day and took breaks to help move the 3-meter long plastic (PVC) pipes that line the coring system. We also sliced the ends off of hundreds of plastic syringes. These are used to collect precise volumes of sediment for analyses. Several scientists from all over the world will be analyzing these samples for porosity, conductivity, water chemistry, and evidence of microbial life and processes. One of today's highlights: we crossed the Middle American Trench! It was very evident in the 3.5 Echosounder profiling system. The system sends a "ping" to the bottom and the ships computers generate a bathymetric profile. It feeds to a computer monitor in the main lab that we can all watch. When we sailed over the trench, we encountered very deep water. There is an amazing amount of topography on the ocean floor here. Why do we use plastic for so many things? What are some of the consequences of using plastic? How can we be more responsible for the plastic that we use?